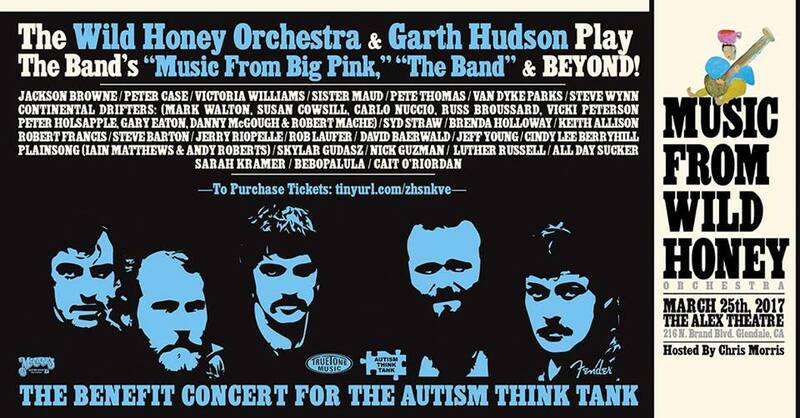 The latest Wild Honey benefit for The Autism Think Tank will be held next Saturday, March 25 at the Alex Theatre in Glendale California. 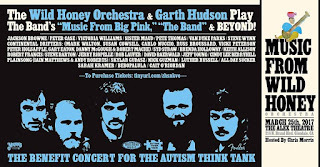 The all-star lineup of musicians playing The Band’s Music From Big Pink album will include original member Garth Hudson, along with Jackson Browne, Peter Case, Victoria Williams, Syd Straw, David Baerwald, Continental Drifters, Plainsong, Cait O’Riordan and several others. On this St. Patrick’s Day, let’s raise a toast to Irish rock and roll, including U2, The Undertones, Thin Lizzy, Van Morrison, The Boomtown Rats, The Pogues, The Cranberries, The Urges, My Bloody Valentine, Them, Little Green Cars, Ash, Something Happens, Sinead O’Connor, The Corrs, and Rory Gallagher. Mahoney’s Pub & Grille on Ogden Avenue in Chicago is holding an Irish Fest tomorrow that will feature bagpipers, Irish dancers, and performances by Maggie Speaks, Three Men In Kilts, and the Larkin Brothers. Barrington is billing its Seventh Annual Celtic Fest as “suburban Chicagoland’s largest St. Patrick’s Day Celebration” and will offer dancers, food and drink, live bands, bagpipers, and local merchants. It will be hosted by McGonigal’s Pub and runs through late tomorrow night. Tickets went on sale today for Paul Simon at Huntington Bank Pavilion at Northerly Island on June 14; two shows by the Bodeans at City Winery on May 26; Ian Hunter and The Rant Band at Park West on May 13; and Heartsfield at FitzGerald’s on May 13. New albums arriving today included Spirit by from Depeche Mode—who’ll at the Hollywood Casino Amphitheater in Tinley Park on August 30, and Hot Thoughts by Spoon. George Harrison’s The Vinyl Collection, a box set containing all 12 of his studio albums, is now available. It also includes a Live In Japan record and two picture-disc 12-inch singles. After hearing an employee at the Graham Cracker Comic store in downtown Chicago talking about a local production of the High Fidelity Musical, I found a a review by theatre critic Kerry Reid on the Chicago Tribune’s website. Reid wasn’t overwhelmed by Refugee Theatre Project’s production but did note, “Christopher Pazdernik's endearing production brims with good-natured enthusiasm and dollops of sly wit, along with a fine onstage band headed by music director John Cockerill.” The play has been extended through March 25. Hard-hitting power pop band Go Time! will be performing at Silvie’s Lounge in Chicago tomorrow night (March 18). They’re still everywhere that I’m not. Translator, who had an FM radio hit with “Everywhere That I’m Not” in 1982, has dates with The Long Ryders coming up toward the end of April in California. Wish they would visit Chicago. The Experience Hendrix all-star tribute to the legendary guitarist comes to the Chicago Theatre next Saturday, March 25. Performers include Billy Cox, Buddy Guy, Zakk Wylde, Johnny Lang, Kenny Wayne Shepherd, Dweezil Zappa, and others. The tribute show Fleetwood Mac Mania will be performed at Metropolis Performing Arts Centre in Arlington Park next Friday, March 24. The Heroes And Villains Fan Fest comes to the Donald E. Stephens Convention Center next weekend, March 25 and 26, with special guests from several popular TV shows. Two-day passes for general admission are $90, Saturday only is $55, and Sunday is $45. Various forms of VIP packages are also available. The 20th Annual Chicago European Union Film Festival is currently taking place at the Gene Siskel Film Center, and by the time it’s finished on March 30, 62 films from 28 countries will have been screened. The Jewish Film Festival continues through this weekend at various venues in the Chicago area. The Last Waltz 40 Tour will pay a visit to The Chicago Theatre on April 19. Warren Haynes, Dr. John, and several other performers will be paying tribute to The Band’s star-studded farewell concert. As mentioned here yesterday, tickets for Lollapalooza 2017 go on sale at 10:00 a.m. next Tuesday, March 21. 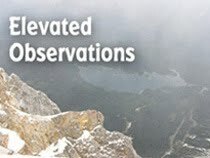 The event takes place in Grant Park August 3 – 6; with a single day ticket running $120 and a four-day pass going for $335. Ravinia announced its 2017 schedule, which includes Santana; Stephen Stills and Judy Collins; John Mellancamp; The Temptations and The Beach Boys; Blondie and Garbage; and The Moody Blues. The LiveWire Lounge on Milwaukee Avenue continues its string of interesting bookings with a show on May 13 that will offer Splitsville, The Handcuffs, Collectors, and Hyperplane. I’m not an avid fan of college basketball, but here are a few interesting things about Northwestern and the 2017 NCAA Tournament: It’s the first time in 78 years the university has qualified for participation. The team’s forward, Charlie Hall, is the son of actress Julia Louis-Dreyfus. According to Chicago Sun-Times reporter Gordon Wittenmyer, members of the Chicago Cubs, including Kris Bryant, are rooting for Northwestern. They won their first game of the tournament last night. Vans Is Releasing HARRY POTTER Sneakers!